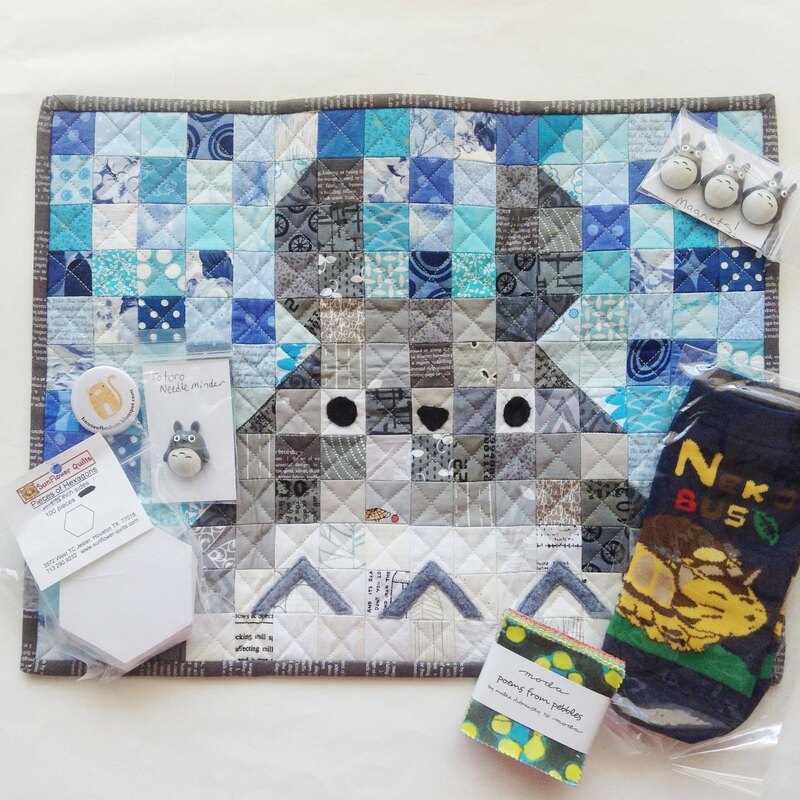 Have you ever participated in an online craft swap? There are always tons of them going on Instagram, and I always think they look like so much fun! I rarely do them though, because in order to make something special takes time that I don't always have. But when the Studio Ghibli Swap was announce, I knew that I HAD to be part of it. I love My Neighbor Totoro, and lots of other Studio Ghibli films, so this swap had the potential to be amazing. My partner Julia liked Howl's Moving Castle (especially Calcifer!) and Totoro and Soot Sprites, so I focused on those things. The little stuffed Calcifer was made using a tutorial I found, but changing it up a little to make it a "Wild Olive" Calcifer. For "extras" I made a triangle zip pouch, and included some socks and nail polish in colors to match the main project. Oh, and some caramel lip balm! I lucked out, because Julia likes caramel, and I didn't even know that! 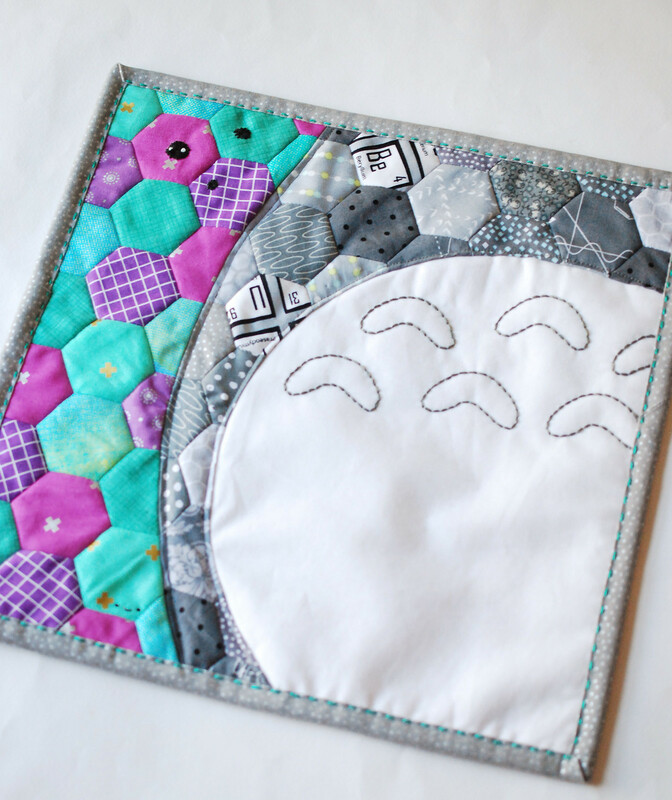 The main project I sent was a mini quilt that I designed to look like Totoro, but only give the essence of him. My partner said she like hexagons, and that played to my strengths! I drew the design, and HOPED it would work as I thought it would. The results aren't perfect, but thankfully those curves didn't drive me too crazy! Totoro's spots are embroidered, and some Soot Sprites are on there too. Magic. If you look closely at the whole quilt, you'll see that I "signed" it with a little face, too. And then, this is what came my way! This swap was set up so you were making for someone different than you were receiving from. Amy made this fantastic mini quilt for me, and sent along some delightful extras. Just look at that Totoro! And Cat Bus socks! And lots of other goodies too. Yes, I did go a little crazy as I was trying to finish my project in the midst of other things I was working on, but I'm so glad that I participated in the swap. Not only was it fun to design something and receive something, but thinking about another person and seeing what everyone was working on made this a really great experience! I love all the cute, bright colors! Those cat-bus socks are just the cutest. Is there a Flickr pool for the swap? I would love to see everyone's items. Hi Mollie, I just love these quilts. Love the Totoro story. How clever just to give "the essence of Totoro" as you say! Thank you for sharing all these ideas with us. I couldn't believe the Calcifier was homemade but I did think it had your "signature" on it! I've seen triangle pouches before but now I'm inspired and this has to go on my "to do" list. I'd love to see other peoples items too, are they on Flckr? 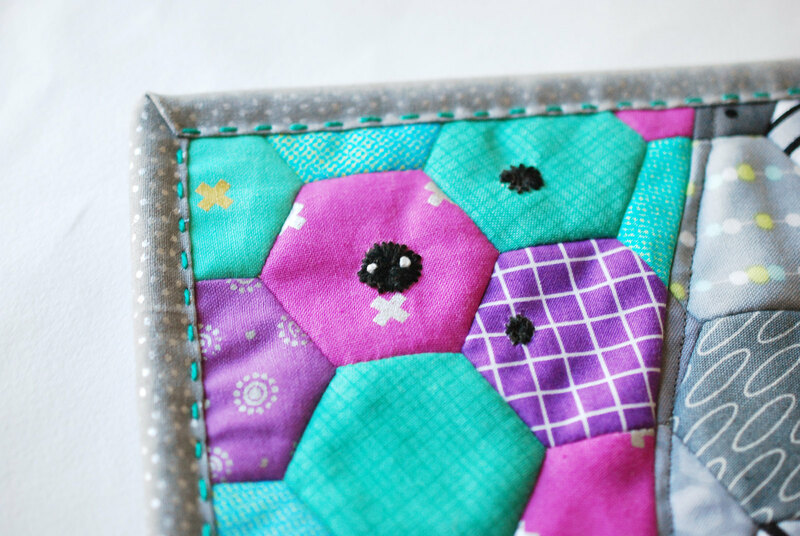 Are your hexagons machine stitched? They look amazing. Other swap packages can be seen on Instagram. Search #studioghibliswap. My hexagons are hand-stitched, and then the curved seams were done by machine. Thanks! What wonderful swap packages. I love your quilt design although I must admit I haven't the faintest notion what you are talking about when you refer to Totoro and Calcifier and all the rest , I'm clearly clueless when it comes to Studio Ghibli. I do love to take part in swaps myself, they can be hit and miss but I've learned to be selective about the swaps that I take part in now and find that as a result they are always a very rewarding and fun experience. You're the second blog I've read that participated. I would have loved this! I love what you got. Everything is adoarable! Oh, I'm gutted that I missed this! I sure love what both of you came up with though. Is there a flickr pool or IG hashtag? I'd love to see the rest. That looks amazing! 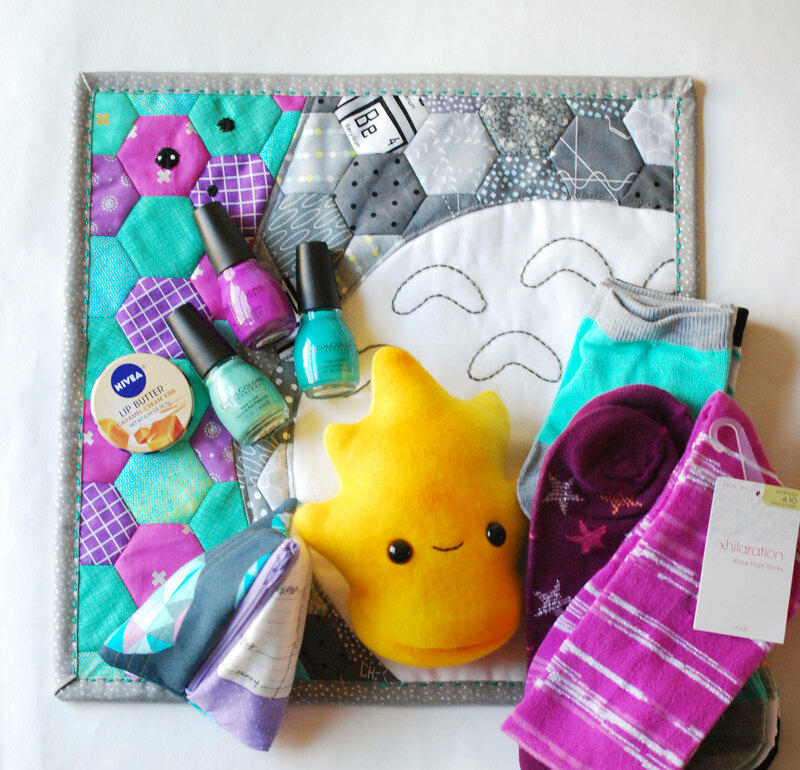 What a great job you both did and such adorable items! 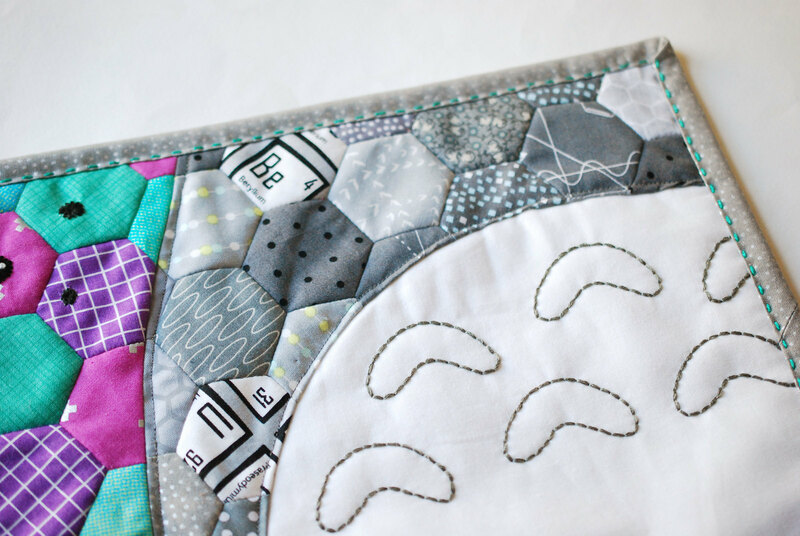 Your hexagon quilt look so amazing @@. Im really stunned. I like the idea, of showing only a part of him... So ppl who dont know about this figure, maybe dont even see something special in this quilt (just that it is awesome work)... but ppl who love ghibli will know with the first view what this quilt is about =). I hope you understand me ^^: im not a english native speaker.